Little moments in time. Events that seem to pass in the blink of an eye but remain in your heart forever. The moment your new Husband sees you in your wedding dress. The first time you see your newborn’s face. The way your little girl scrunches her eyebrows when she blows out her birthday candles. The holiday photo that shows four generations smiling. The corporate retreat where you learned you were getting the promotion. The event that raised more for your favorite charity than any year before. Little moments are like little flowers. Perfect and beautiful, you can’t help but stare. 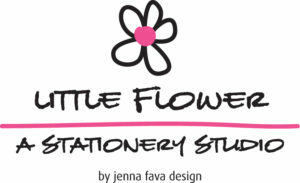 Little Flower Stationery Studio can capture those moments before they even happen. We create the correspondence that expresses your personality. We help you introduce yourself, your event, your child, your family, your memorable moment to the world. Need a wedding invitation? We can create a custom image that includes save the dates, a couple’s monogram, invitations, programs, and favors. A baby announcement? Let us introduce the world to your new addition with shower invites, personalized announcements, and nursery art. Looking for a holiday greeting that will really express your family? We can help you incorporate a year’s worth of memories in one card. One of the kids having a birthday? Not only can we help you theme the party, we can design decorations, invites, favors, and more. Perhaps you have a business that needs help with theming and design for a corporate event? From planning to implementation, we can help with every aspect of design. If you are a nonprofit looking to theme and design a fundraiser, not only can we help you perfectly set the scene, we can do it within your budget so that you maximize profits at your event. Contact us to discuss…it’s never too early to start planning your memorable moment.